Sebastian Margarit and his wife, Brenna Koneczny are proud to be a first generation farm. They built their farm, Vista Bella Farm, from almost the ground up and now, nearly 10 years later, they are more than ready to expand. Vista Bella Farm, established in 2007, is a small scale fruit and vegetable farm located on the scenic shores of Malagash, NS. While Vista Bella Farm deals mostly in heritage apples, they also produce cherries, plums, pears, gooseberries, currants, asparagus, yellow and green beans, potatoes, mesclun salad mix, pumpkins, winter squash, and much more. In operation for ten years now, Sebastian and Brenna purchased a neighbouring farm in 2011 to expand their operation. They currently have 131 acres of land, six bearing fruit and another 2.5 that are planted. By the end of this season they will have another acre planted. They grow about three acres of mixed vegetables each year. In addition to the farm store where customers can purchase their vast variety of fruits and vegetables, Vista Bella Farm offers apple picking in the fall. As first generation farmers, Sebastian and Brenna moved to Malagash from Earltown to grow exotic vegetables. 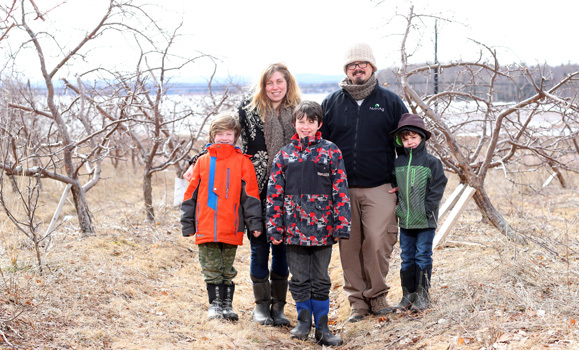 While Sebastian grew up in Amherst and Brenna between Bedford and Newmarket Ontario, they quickly learned that the Malagash soil was much more suitable for tree fruit production. At Vista Bella Farm, apples are their specialty. With so many varieties of apples, Vista Bella Farm has recently added a new component to their farm. Malagash Cidery is set to open to customers this summer. “The new cidery will allow us to showcase some complex varieties in a way people can appreciate,” Sebastian explains. Last year a store was built for apple and vegetable sales so Sebastian and Brenna will sell their cider from that. They hope that one day they will be able to construct a full hospitality suite and potentially an outdoor deck. The cider produced at Malagash Cidery will initially be sold directly to restaurants but will also be available for pre-order by the case. As things progress, Brenna and Sebastian are hopeful that the cider will be available in a few retail locations and select restaurants in Truro and Halifax. Sebastian explains that the idea for their cidery came to him through his work. 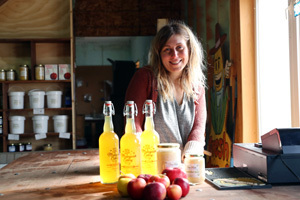 After exploring different types of ciders and different styles of cideries, Sebastian and Brenna realized that the small boutique-style cideries were within their reach as a small producer. They took time to visit family in France where they also fell in love with the high tannin, multi-variety, cloudy but delicious ciders. They toured a cider museum and spoke with locals about cider making. The pair also had the opportunity to visit Spain to sample Spanish ciders. Needless to say, Brenna and Sebastian did their homework. After playing around with their own personal size batches of cider, Brenna and Sebastian purchased a small mill and bladder press to be able to make larger batches. They invited their community to “U-Juice” days, similar to apple U-Pick days but with cider pressing. Sebastian explains that they were able to take advantage of this and encouraged people to try their cider and give their feedback. He explains it was a great opportunity to understand what people’s tastes really were. With that in mind, Sebastian and Brenna are now ready to offer their cider to customers. 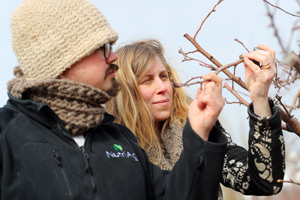 With a vast selection of apple varieties already, Sebastian and Brenna want to add even more apple varieties to their farm to complement the cidery. Their goal is to have over 100 varieties of apples planted by next year, with around 50 varieties already bearing. 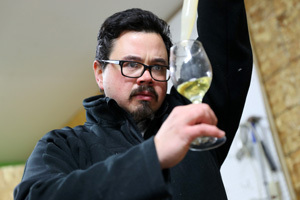 “We are convinced through our own cider making trials that the complexity of a cider is linked to the diversity of the apples going in and so the more variety we introduce the more subtlety of flavors we can expect to find,” Sebastian says. Sebastian and Brenna admit, while their farm is thriving now, it wasn’t easy to get where they are today. One of their biggest challenges has been that they are a first generation farm. Though they are a first generation farm, the orchard they currently have was planted by Bob Barbour and Elizabeth Barbour. As their cidery gets set to open, Sebastian and Brenna reflect on the hard work that got them where they are today. Their hard work and dedication to their dream is admired by many local farmers. Although neither Sebastian nor Brenna come directly from a farm, their passion for agriculture began at young ages. Sebastian’s interest in agriculture began when he was 18 with a community garden project in Amherst where he grew up. The garden project grew vegetables for a local foodbank. Sebastian soon realized his passion and both he and Brenna have worked hard to get where they are today. For Sebastian and Brenna, not only is it important for their farm to thrive, it’s important to them that they give back to their community. Sebastian explains that they are very community oriented and try to be involved as much as possible. In addition to their community involvement, Sebastian and Brenna aim to make their products available and affordable for everyone. As a small but growing farm, Vista Bella Farm’s biggest frustration is offering full time employment for people living in their community. Brenna and Sebastian currently manage the full time jobs on the farm- Brenna is the primary proprietor and deals with retail, bagging and sales, while Sebastian looks after the general agronomy decisions. The other employment opportunities are currently seasonal opportunities. Although this is their current reality, Sebastian explains that their goal is to overcome this. While Sebastian and Brenna are proud of the farm they have built, their greatest pride comes from being able to raise their children on the farm. Their three boys, ages 10, seven, and five, have vast knowledge of the fruits and vegetables that are grown on the farm.